When someone passes away without making a Will their estate is dealt with by a set of rules in law called Intestacy. The rules of Intestacy set out clearly a list of people who are entitled to inherit should somebody pass away without having made a Will. This can also apply when somebody makes a Will but it is deemed to not be a valid legal Will i.e. when it has not been signed properly at the time that the Will was made. We have set out below the sequence of people who would be entitled to inherit in the order of priority which will help you understand the rules of Intestacy and how they apply when someone dies without having made a Will. If the deceased person is married or has a civil partner that spouse or partner is the first person under the rules of Intestacy entitled to inherit. If the person who has died is divorced or if the civil partnership has come to an end then the divorced partner cannot inherit. If the person is separated but not divorced then they are still entitled to inherit under the rules of Intestacy. If, however, the deceased person has surviving children, grandchildren or great grandchildren and their estate is valued at more than £250,000 then the surviving spouse/civil partner is entitled to 1) all of the deceased’s personal possessions, 2) the first £250,000 of the deceased’s estate, 3) half of the balance of their remaining estate. If someone dies without leaving a surviving spouse/civil partner but they have children then those children will inherit all of their parent’s estate and if there is more than one child then the estate will be divided equally between them. Children will only inherit when they reach the age of 18 years or if they marry or enter into a civil partnership before they are 18. If there is no surviving spouse/civil partner and the children of the deceased have also passed away then the estate would pass to the grandchildren or, in some cases, great grandchildren. Again the grandchild/great grandchild has to be over the age of 18 unless they are married or in a civil partnership and if there is more than one the estate would be divided equally between them. If there is no family who can inherit the deceased’s estate i.e. 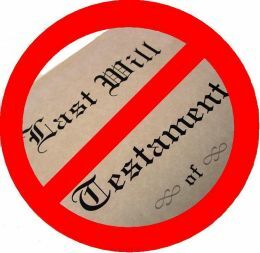 if there are no spouses/civil partners, children, grandchildren, great grandchildren or any of the other relatives mentioned above then the deceased person’s estate would pass to the Crown. This is known as bona vacantia. The Treasury’s Solicitor is then responsible for dealing with the estate and all of the proceeds of the estate will go to the Treasury/Crown. It is important to note that unmarried couples/partners are not entitled to inherit under the rules of Intestacy. The rules of Intestacy are designed to set out provisions where somebody does not make a Will to ensure that there is an element of certainty as to who will inherit from someone’s estate in these circumstances. The best way to avoid these issues and to ensure that your relatives are not left with any difficulties in distributing your estate in the event of your passing is to prepare a Will. If you would like more information about the rules of Intestacy or if you would like to consider making a Will please do not hesitate to contact our offices on 01654 711499 or 01341 281108 or email abright@alwenajonesbright.co.uk.